A new project investigating health and social care for older people in Huntly has been launched. 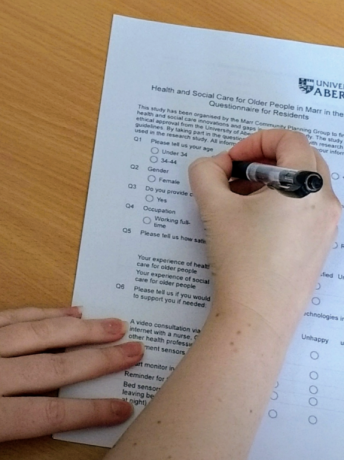 On behalf of the Marr Community Planning Group, funding from Aberdeenshire Health and Social Care Partnership is being used for the research study on Huntly Health and Social Care for the 2020s led by experts from the University of Aberdeen. Over the next three months, researchers from the University will be seeking the views of residents and those who provide health and social care in the area such as district nurses, health visitors, care workers, volunteers and community groups. The aim of the project is to identify any gaps in services and to come up with innovative ways of working for the future. Dr Rachel Shanks, a Senior Lecturer in Education at University of Aberdeen, is leading the project. She said: “This is a great opportunity to find out what older people in Huntly think would improve their health and social care and we are looking forward to meeting residents to discuss the issue over the coming months. "We hope to speak to as many people who either access or provide services in the Huntly area to gain as broad-a-picture as possible of current provision as well as gaps in the service. Janelle Clark, Chair of the Marr Community Planning Group said: "This is an important issue for Huntly and many other communities across Scotland. Health and Social Care provision is essential to the quality of many people's lives and we are delighted to be working with the University of Aberdeen to examine current provision and to develop new ideas to improve services."